I have seen more giving happen in the past 5 years through the Charitable IRA Rollover than through any other means of giving. The immediate tax deduction from funding an IRA, 401(k) or other retirement account is attractive, especially to high income earners. By socking money away they can reduce their current income and maximize retirement savings. In many cases we see the tax advantage being so appealing that folks neglect their savings in other areas. They fund their tax-deferred retirement accounts while neglecting the Roth IRA or taxable savings. We see folks that have saved large amounts for retirement but eventually the tax-deferred nature of these accounts catches up with them. When folks continue spending in retirement or are required to take distributions at age 70 & ½ they grieve over the large tax burden. We have written about planning for tax diversification here: Don't Put All Your Eggs In One Bracket. 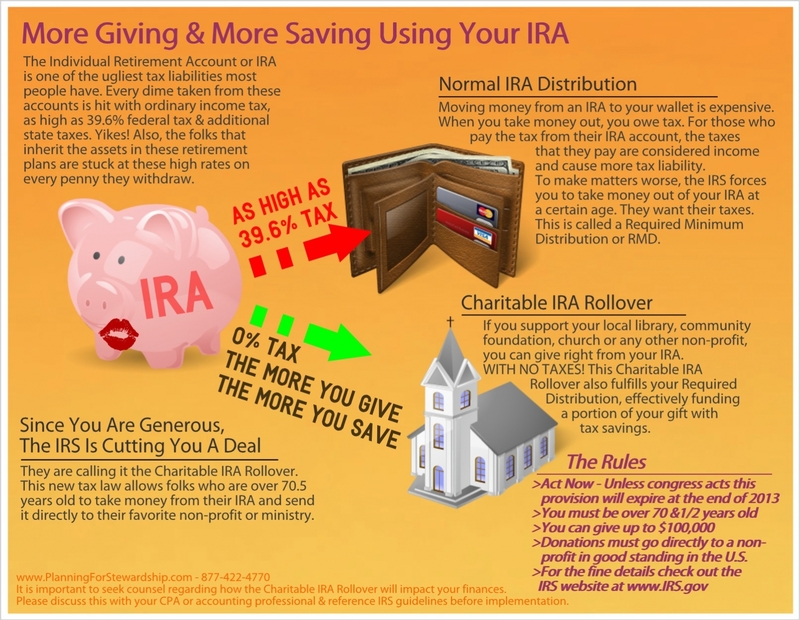 Because so many families have a substantial tax liability associated with their IRAs we have been excited about the Charitable IRA Rollover. We have seen families find real meaning and purpose and substantial tax savings by supporting their favorite non-profits, ministries and even their church using their IRA assets. They can have their custodian send a check right to their favorite non-profits and the distribution fulfills their Required Minimum Distribution. It has been really fulfilling for me to work with these generous families to accomplish amazing things and reduce their tax liability. The IRS guidelines on the topic are great bedtime reading but I have been trying to find a new way to share this info with folks. I’ve put together an infographic in hopes that this great concept might ‘click’ for families. If you are with a non-profit this is a sweet deal. If you haven’t shared this concept with donors over age 70.5, you should. What an opportunity for you and for them before year end. - If you meet the guidelines, this is a great way to support the organizations you care about. Call your advisor today. - Engage CPAs and Financial Advisors in your community. Ask them to serve on your board and to keep you posted as these great opportunities come up. - Subscribe to this blog and I’ll keep you posted. I’m thankful for what you do and I want to help. - Look like a rock-star as you look out for clients best interest. If you have folks with an IRA and they are over 70 & ½ years old give them a ring and learn about what really gets them excited. You may manage a bit less money but you’ll have a whole lot more impact and a better relationship with your client.